- The great news is that no one died. 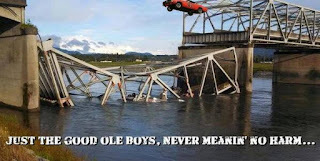 The guy in the truck that clipped the bridge pulled over immediately. Two cars went in, and three people were rescued, one briefly hospitalized. Part of the reason for the lack of fatalities is that the Skagit river is very shallow at this point (though bitter cold, coming directly off the snowpack). The bridge (lower left) in ancient, more intact times. - The bridge worked the way it was supposed to. I know that sounds weird, looking at the fact that its southernmost chunk of it is resting comfortably on the river bed. But the idea was that when it failed, it was supposed to fail in that fashion, Further study may reveal additional problems, but the idea is that one span falls down and leave the others intact. 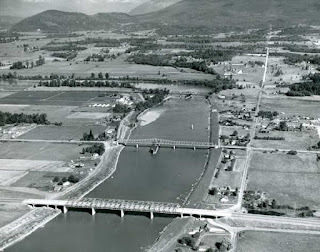 The big danger when this went up was not so much oversized trucks, but earthquakes in the soft earth of the floodplain. - The bridge was completed in 1955, which makes it only slightly older than I am. Some days, it feels like the bridge is in better shape, but I haven't been hit by as many trucks. - One thing that I've noticed here, and earlier in the Boston bombing attack, is that we, as a people, are good with having cameras running all the time. About ten years ago a friend and I went to lunch and got into the subject of surveillance society, and I pointed out that we had been on camera about five times since we had left my office. That same route would probably be twice that now. In the wake of any event, people want the primary evidence that a running camera provides. As you may have noticed the detour route near the Skagit River keeps changing as we try to make sure people can get past this bridge on roads that weren't meant for as much traffic as we are seeing now. Be sure to check our website before you head out. Expect to add at least an hour to your trip time if you are going that way, or even better plan to stop by one of the local businesses and have lunch on your way through. Don't forget that Amtrak Cascades is also a fantastic option to get through the area and around the detour. There might be another possibility of a detour route, we are still working to adjust the ramp to just the right height (and just try to get that song out of your head). Yes. WSDOT did post this. Credit to Mark Nesteroff, twitter user @proudestmonkey3 for the source of this photo. - Unfortunately, despite WSDOT's recommendation, people are not stopping at the local businesses. It will impact the rest of the state as well. I-5 North is one of three major highway routes into Seattle - the others being I-5 South to Portland and I-90 over the Cascades (which gets closed when we have heavy snowfall). I-5 South crosses the Columbia at the Columbia River Interstate Bridge, which if anything is in worse shape than the Skagit bridget. Now we have rail and a deep port, but it would be easy to seal off Seattle from car traffic fairly easily (as opposed to, say, Gotham City in Dark Knight Rises). Mean meme. Accurate, but mean. "Is the Democrats' first priority to investigate to learn what actually happened so they can initiate a fact-based, measured response? Of course not. Instead, they're ghoulishly, crassly, exploitatively, and predictably demanding the Legislature unilaterally raise taxes $8.4 billion -- without a vote of the people"
- Of course, a functioning government can do both, and it seems that WSDOT is well on its way with its investigation. 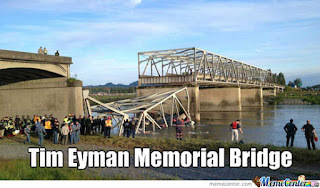 Not that it will stop Mr. Eyman from thumbing through his thesaurus to find for epithets to hurl at people who actually want to fix the problem. - And finally, and most importantly - Skagit rhymes with Badge-it, not Bag-it. So I had a full Saturday, this Saturday last. Tai Chi demonstrations, glasswork of the elder gods, Seattle traffic raised to its ultimate level, drinking at a gamer's bar, and a children's Cthulhu book. First things first. 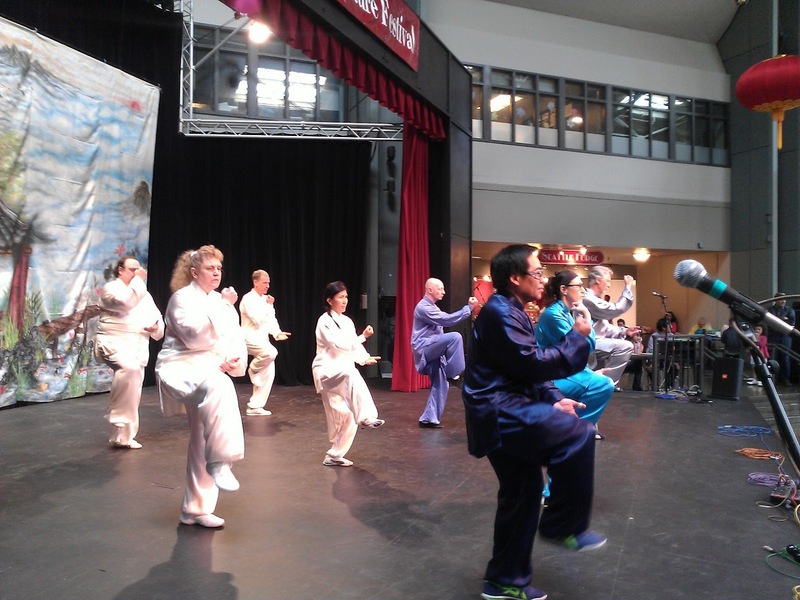 I practice Tai Chi under Master Yijiao Hong at the Chinese Wushu And Tai Chi Accademy. About once a year or so, we're asked to make a public demonstration, usually at the Armory of the Seattle Center, and usually for a cultural festival (The one was "A Glimpse of China: Chinese Culture and Arts Festival"). This year, we performed four demonstrations - two Tai Chi forms, and two Tai Chi Sword forms (I performed in the two Tai Chi forms, while the Lovely Bride did those and one of the sword forms as well). It was enjoyable, and the other presentations over the afternoon included other martial artists, dance troupes, musicians and about thirty small children dressed up as ducklings (who were very, very cute). 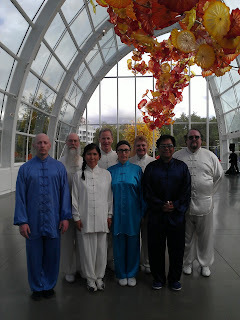 This, year, in addition, we were asked to perform at the Chihuly Garden and Glass Museum next to the armory. The garden/museum is a new thing, and just celebrating its first anniversary. The entire complex is built on the site of the former Fun Forest, a small, weathered amusement complex that needed renovation, but not elimination. The museum turned this Fun Forest into an enclosed glass garden with a price tag enough to keep one at bay, unless one was a Chihuly fan, which I was not. Yes, I know. I look like a snowball. 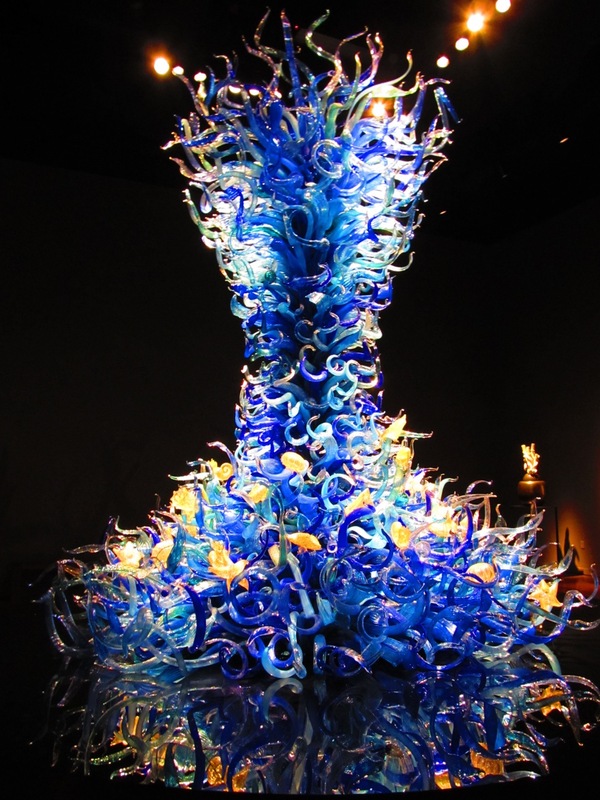 Dale Chihuly is a Seattle Artist made legendary by his colorful and flowing glasswork. Most of his work I have seen has been in terms of single pieces, which are often colorful, half-melted bowls. I wondered what the big deal was, and how this would rate removing a tilt-a-whirl. However, the museum itself is a marvel of installation and presentation. Large darkened rooms with focused lighting turn the colors of the glasswork magic, their rich colors glowing under the illumination. The adjacent garden is a combination of plants with the layered spheres and organic glass seedpods and glowing spikes of the artist's works. A single Chihuly is a interesting item - a forest of his glass forms is overwhelming. The garden is built around a glass structure used for private functions (every museum needs at least one of these in these multi-tasked, fundraising days), and it was within this oversized greenhouse, dominated by crystaline flowers overhead, that we did the second performance of the day. And we actually did pretty well at that (my personal fear is always that I will stand on one leg and, topheavy, go sprawling over backwards - much of my style can be described as "staying upright"). It was well-received (we drew a crowd) and it was in one of the places where you could swing a sword without worrying about taking out any valuable, valuable, artwork. Who ordered the Flying Polyp? In doing the second demo, we were given the chance to walk the grounds and check out the art. As I said, a small piece of Chihuly is an interesting bit, but combined into large, flowing forms twenty feet high, the end result looks like something that has escaped from an elemental dimension into ours. His works among the garden are like the flesh organic plants described by Clark Aston Smith in his short stories, and his fiery oranges and reds seem to contain eldritch radiation leaking into our world. Chihuly, in this moment for me, becomes C'thulhi, glassblower of ancient, now-sunken lands, his work a testament to forgotten gods. Two performances in one day were a bit much for me, particularly since I overdid myself and tried to get lower for moves like "Snake Creeps Down". It left me limping back to the car, and I began a long sojourn north to celebrate another version of Cthulhu - this time in a children's book. But let me whine a bit about traffic. To native Seattlites, the "Mercer Mess", which stretches from the I-5 to the Seattle Center, is a legendary chunk of road, famous for its congestion, renowned for its utter badness. And any attempt to fix the damned thing is going to involve some additional heartache. But to close it where Mercer meets the north-south I-99 is the equivalent of delivering a Vulcan Nerve Pitch to the city. In my case, rather than face the traffic, I tried secondary routes up Queen Anne, found the secondary routes equally clotted, and spent about 45 minutes limping back to the highway, as if my vehicle had down two sets of demos and crouched too much for "Snake Creeps Down". North was my goal, for the AFK Tavern. The AFK is a gamer bar, board games at the ready, food items names after pop cult fantasy and science fiction, video screens showing Starcraft games in process. It is up in Everett, because apparently King County adds Bar+Games and gets Casino, and after getting lost around the Alderwood Mall, got there. Sort of like La Belle Epoque, but with more d20s. 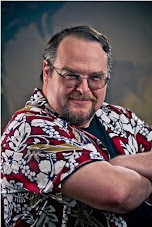 The reason for celebration as "The Littlest Shoggoth", the creation of Stan! Brown. Stan! is a nifty cartoonist and a societal hub of many universes, and ran a kickstarter to get his book in colored, hard-covered form. The result is one of those perfect Christmas gifts for the cultist that has everything. Stan! took a break from continually mailing out the tome to his Kickstarter supporters to come celebrate, and it was a gathering of nerdom. Touched base with a lot of the people that I haven't seen in a while. discovered new jobs, engagements, secret projects, and the general chatter that keeps nerds in communication. I also met someone I had been playing games with online for near on a year, but had never met In Real Life. We feasted on Shoggoth's Eyes (scotch eggs) and drank local beers (a very pale beer called White 'N Nerdy"). It was a long, long drive back, and today I am paying for my city-trotting socializing with aching knees. But still, one of those Saturdays that makes me appreciate living out here in the Pacific NW, even if it means I have to deal with the Mercer Mess. (Tai Chi pictures by Yijiao Hong, AFK picture by Rodney Thompson, Flying polyp picture by Unamit Ahazredit. Remember to make you SAN checks). OK, if you're a Pittsburgh native (and even if you aren't), you really should watch this - a collection of movies filmed in Pittsburgh, with a lot of attention to Batman and Inspector Gadget. I think Dogma is missing, along with The Bread My Sweet (which features my Mom-In-Law as a meter maid). Just enjoy. Ah, spring is in the air, the rhododendrons are blooming, and it becomes once more, time to review this year's crop of National Park Quarters. Long ago and far away, I started examining the State Quarter series, and once that was laid to rest, a NEW series, called the "America the Beautiful" series, launched. The rules were similar - each state (and a handful of colonial properties) gets a coin to push one of their scenic national parks, forests, memorials, or what-not. For some states this is a bigger challenge than others, but all have showed up with something. As is usual, we rate this year's crop of National Park coins on design - Here's the rating system. Bonus points given for scenes that make sense, are easily recognizable, and have a good feel to the touch.This year's crop is OK, but not really spectacular. Let's dig in. Yeah, it's a mountain. And it IS white (well the drawing is - I suppose the coin would be silver. So we at least have truth in advertisting going on. And the carving is not particularly BAD - in fact, the bracketing birch trees could give the coin a good feel against the thumb, a ridge for the center white space of the view of the mountain. But the subject matter? I mean there feels like there are a bunch of states that do the forested-view-with-large-landform thing both in the previous series and in this one. All that is missing is some form of native wildlife in the foreground to give it a feel of animation. And New Hampshire is probably hedging its bets. Its state quarter had the Old Man On the Mountain, which then COLLAPSED. I think they're just taunting the mountain here to fold in on itself. Did anyone think of Lord Nelson when they saw this one? I know I did. Guy in naval uniform. Tall Doric column. I mean, if this was a contest of Pictionary, the answer would be - Nelson's Column. But no, this is Admiral (well, Master Commandant) Perry, who is OUR admiral for the age of sail, whose middle name literally WAS Hazard, and who gave us a victory on Lake Erie during the War of 1812, facing off against the mightiest navy in the world, primarily because a) the mightiest navy in the world was busy fighting Napoleon and b) the mightiest navy in the world couldn't GET to Lake Erie because NIAGARA FALLS was in the way. But hey, a win's a win. And though we are in the bicentennial period for that war (and the bicentennial of the Battle of Lake Erie is September 10th, so get you Battle of Lake Erie card orders in NOW). We aren't talking a lot of about the war. which sort of indicates who we really thought won it. Canada on the other hand is excited about it, and they weren't even a nation yet. I'm kind of interested to see next year if anyone even mentions the burning of the White House (except FOX, of course, which will blame Obama for not keeping us safe). And the coin is celebrating mixed messages - Perry's Victory AND the Peace Memorial. Military Victory AND the fact we've had a long, relatively peaceful border ever since. And it is ironic to note that this is set in Ohio, which doesn't HAVE a land border at the present with Canada. So it is a coin dripping with irony, right down the fact that the visitor center for this island-based park (reachable by ferry or airplane, when Jet Blue is flying) is delayed to open because of the sequester. But quarters they can afford. OK, Nevada doesn't have a lot to work with here. I would have thought that Hoover Dam would be in contention, since it IS a National Historic Landmark, but then maybe they would have had to share it with Arizona if they did. So they have the Great Basin, which is notable for being miles and miles of miles and miles. And yet, they've done very nicely. The choice of the bristlecone pine looks a bit like it is going with Treebeard to take on Saruman at Isengard, but the use of different textures is going to be nice for the feel of the coin, and pushing it one side makes the static object more dynamic. So yeah, in a modest year, this is one of the better ones. Another entry in the War of 1812 theme of this year, this one commemorating the crystal entity from Star Trek attacking the Fort, before being scared off by the Omega Glory (double geek points for getting that one). OK, it really the shelling of Fort McHenry by the British, though its not. From the notes it REALLY is showing traditional fireworks going off during the "Defender's Day" celebration of the fort. So you get the flashiness, when really the fort and the British Ships were shelling each other at long range. So this is another win from the Wo12 - the British, fresh from burning Washington (Thanks, Obama!) moved onto Baltimore, sailing up the Chesapeake. They were foiled by land batteries, a line of sunken ships, and the fort. Neither side got close enough to do significant damage to each other, but the British were foiled, and in the process we got a poem that was later welded to an earlier drinking song to become the Star Spangled Banner. The coin itself, despite the fireworks, feels a little flat at first blush. The explosions work from an eyes-half-closed sort of look, and while the flag is good (indeed, when was the last time you saw a flag on the coin - some old bicentennial quarters?) the buildings are just sort of squatting there. So here's a challenge - what do you do when the state quarter bogarts the killer view of your most memorable feature? Arizona pulled things off nicely by shifting the view of the Grand Canyon entirely delivering a superior coin. South Dakota, on the other hand, gave us this. They gave us a close-up of Jefferson's Nose. Actually, it is an in-process shot of carving Jefferson's face (working on those baggy eyelids) while the scaffolding behind supports the almost unrecognizable face of Washington. The carving of the monument is a cool thing, but the series is America the Beautiful, not Nostrils of the Founding Father. This one is honestly WORSE than the State Quarter, with its giant pheasant flying over the classic view of the memorial, and that takes some doing. It takes a recognizable icon and hides it entirely. That takes work. That wraps this year's batch, and next year has a whole heaping helping of natural features. I predict we will see trees, mountains, and the occasional local wildlife. DOW Breaks 14000! No, wait! I mean 15000! It has been a while since the last "DOW Breaks" write-up - over a year, so here are the rules. For the purposes of this blog, it simply means ratcheting past a milepost - since the last write-up occurred at 13000, the stock market would have to sink to 12000 or rise to 14000 before it merited another note. It has to end the day at the milestone or above. And it is a good chance to take a look at the economy in general.. The DOW actually crossed 14000 back in February, but I didn't mention it then because, you know, Hawaii. And despite the common thoughts about how the current administration hates Big Business, and liberals in Washington are so gung ho to dismantle Wall Street, the market continues to surge upwards. Indeed, it seems that this is the best part of the economy right now. If there are truly socialists in charge, they are doing a horrible, horrible job at it. And the rest of the economy is decidedly "Meh". Not for the bigs - they seem to be doing pretty good. But for most of us shmoes, the job providers don't seem to be providing much, despite their supposed good fortune. Employment continues its slow, incremental recovery. Seattle, with its regressive taxes and progressive stance, seems to be doing pretty well, but for a large swath in the country, most notably in the redder sections, life is still kinda sketchy. And I have to look at why, and I think I have a reason that hasn't shown up what passes for wisdom among the pundit class. It is because government and its attendant deficits are not growing. In fact, they are shrinking. Government is smaller now than when we started this current recession, and the deficits are currently reducing (the overall debt is another matter - there is a difference). This is important because government spending has in the past led the way out of recessions. Yeah, yeah, you supposedly can't spend your way out of a recession, but that's exactly what we've done previously. Government steps in and starts placing some orders, be it roads, tanks, or new weapons systems, and the private sector takes the hint and things get moving again. This time, not so much. While I don't think the current administration are austerity hawks (and while I am amused by the reports that the research that austerity being a good thing is wrong because of a cut-and-paste error, it sounds really too perfect to be true), they are serious about making government smaller and more efficient. Which means it costs less. Which means that there is less money thrown around to get things going again. And no one wants that when their particular fiscal ox is offered for the BBQ. This is a common problem with the current system - everyone hates government spending, but the moment that the big factory that makes warning stickers for OSHA reports is closing, or the local military base is being shuttered because we haven't had a war with Canada for 200 years, then everyone is indignant that the government is not paying attention to the needs of its people. The idea that the government is completely independent from the economy is a polite fiction, at best. And yet in the midst of this no one seems to own up that government is getting smaller, and that as a result we aren't spending money to get the economy rolling again. I can see why the Republicans are all-fired quiet about it - here's a president who is doing what they have been claiming needs to be done (yet never seem to get around to doing). If it doesn't work, then that sort of undercuts their entire rational. On the Dem side, you'd think they would be glad to shed a tax and spend image tossed them by their Distinguished Competition, yet they don't want to be shown holding the bag for the attendant economic misery. The thing is, a smaller government is a good thing - long term. It shows we can get out of these messes without ratcheting up the system one more notch. It backs us away from the cliff. But it is a slower, more painful process, and will still have economic suffering going forward, as everyone tightens their belts. Except for the guys at the DOW, of course. For them, things are just ducky.